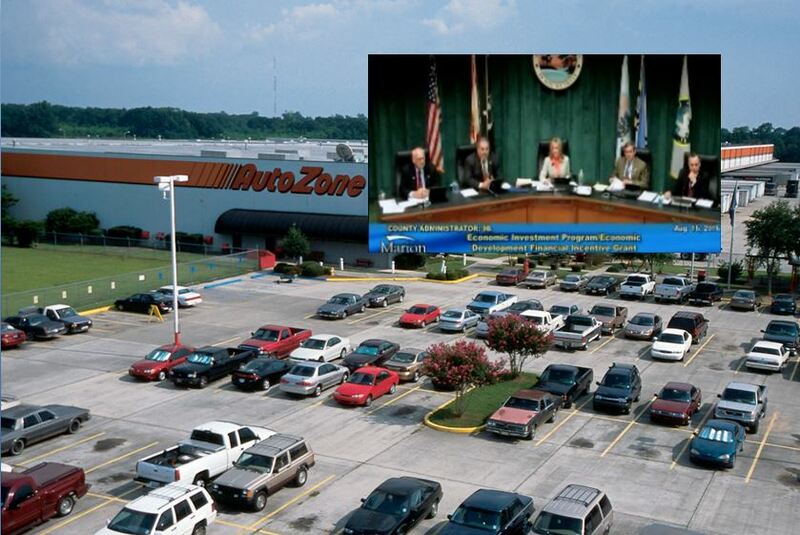 Marion County — For more than 22 months, the Memphis-based auto parts giant, AutoZone, which is worth more than $20 billion, secretly negotiated with City of Ocala and Marion County leaders to build a 444,000-square-foot distribution center in Ocala. Commissioner Stan McClain was the driving force behind the deal. Officials said the company will invest $50 million into the community, but in actuality, the facility itself will cost $50 million, including machinery, to build. The distribution center will be built on 60 acres, located at the commerce park off of I-75 and U.S. 27. According to county documents, the City of Ocala and Marion County will each pay $144,000 to draw down funds from Florida’s Qualified Target Industry Refund Program. Marion County will pay the $288,000 up front and the city will pay $144,000 back to the county at a later time. But the incentives do not end there. Documents also show that AutoZone will receive $3.75 million from the city and county each over the next 30 years, or $125,000 a year. Plus, the city will pay $554,070 for application, impact, and permit fees. The project also requires the city to offer AutoZone electricity at an undisclosed reduced rate for the first five years they are in business. This is concerning to utilities customers who recently were notified of rate increases on their utilities bill. Additionally, the state is contributing approximately $1.1 million to the project. AutoZone will be required to create at least 192 jobs in the next few years, with a total of 240 jobs. Salaries will have an average of $38,000 per year. The city will also be bidding on internet and phone services for the company. With such a large dollar amount in incentives being handed out to AutoZone, a reasonable person could conclude that the city, county, and state stand to profit greatly from the project. “I have no worries that the city will get a worthwhile return on its investment,” Ocala City Council President Jim Hilty said. In an e-mail, Ocala Post asked Mayor Kent Guinn how much the city would profit from the deal. The e-mail was never answered. This project, known as “Project Horizon,” was not heavily discussed or advertised to the public. In fact, the first mention of this project in a public meeting was on June 22, 2015. “On June 22, 2015, the Board approved “Project Horizon,” or AutoZone, as a qualified target industry (QTI) supported by Resolution 15-F-191 with an appropriation of up to $288,000 as the county’s local 20% participation in the QTI Tax Refund Program. The Board opened up public comment, but none was given,” McClain wrote in an e-mail to Ocala Post. The project was not again mentioned to the public for more than a year. On August 16, 2016, a second meeting was held and the project was approved. Because it was not heavily promoted or discussed, most citizens in Marion County had no idea that the AutoZone project was on the agenda, therefore no public comment was given and “Project Horizon” was approved. Bryant publicly announced during the August 16 meeting that she does not take to kindly to being accused of breaking the law after two citizens accused the commission of being less than forthcoming on other issues. She stated that she doesn’t have to prove she has not broken any laws. But not everyone thinks the AutoZone distribution center is a bad idea. Allowing for public comment on such projects is required by law under Chapter 286 of the Florida Statutes, especially when it involves public money. Technically, county commissioners followed the law and allowed for public comment. However, keeping a project secret for 22 months is a sure way to make sure residents did not show up for the meetings. Kirk Allen and John Kraft — two military veterans who established a group called the Edgar County Watchdogs, say it is reasons like this that the two made history in 2014, when they had an entire county board arrested. The two veterans have since had requests from citizens all over the U.S. asking them for help with their local governments. What do you think, should the project have been more openly discussed to give taxpayers a fair chance to speak on the issue?